Sister Jeroma Day, BVM died Friday, March 22, 2019, at Caritas Center, Dubuque, Iowa. Natural burial Rite of Committal was Monday, March 25, 2019, with burial in the Mount Carmel Cemetery. Sharing of Memories and a Memorial Mass was on Thursday, March 28, 2019, in the Marian Hall Chapel. Sister Jeroma was born on Oct. 12, 1938, in St. Paul, Minn., to John and Veronica Kennelly Day. She entered the BVM congregation Sept. 8, 1956, from St. Michael Parish, Lake Elmo, Minn. Sister Jeroma was an elementary teacher at St. Agnes, Phoenix, and Incarnation, Glendale, Calif., and media center coordinator at Our Lady of Angles, Chicago, and Red Cloud Indian School, Pine Ridge, S.D. In Iowa, she was a librarian and resource assistant at Clarke University, Dubuque, and a pastoral minister at St. Mary in Guttenberg, Mother Cabrini in Richland, St Joseph in Pleasant Plain, and South Center Catholic Common in Chariton. 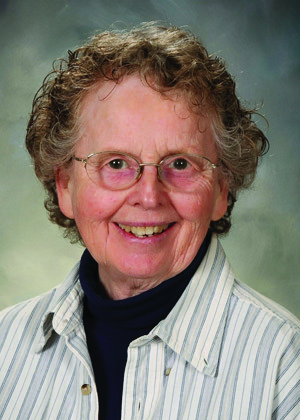 She also was a pastoral minister in Wyoming at St. Anthony in Casper and St James in Douglas; in Minnesota at St. Leo in Hibbing and Freelance Ministry, Inc., in Winona; in Elroy, Wis., at St. Patrick; in Huntingdon, Tenn., at Carroll County Catholic Mission; and in Rosedale, Miss., at Sacred Heart and Delta Dominican Ministries. She was preceded in death by her parents and brothers John, Jerome, Robert, and Bernard. She is survived by a sister Margaret Schmidt, Lake Elmo, Minn.; a brother Richard (Pam), Stillwater, Minn.; a sister-in-law Joan Day, St. Paul, Minn.; nieces and nephews; and the Sisters of Charity, BVM, with whom she shared life for 62 years. I remember this lovely and friendly woman when visiting my brother and sisters-in-law for our annual St. Patrick’s Day celebration in Arizona. She was engaging and eager to celebrate.